STEWARDSHIP OF TREASURE - Thank you for your generosity! Most of our parishioners are blessed with consistent paychecks. Yet, have you ever thought about how you would manage your bills and schedule your payments if you were never sure how much money you were going to have in your bank account? This is a problem that our parish faces every month. Weekly giving can fluctuate considerably each week. While we are most grateful for any gift you give, please consider online giving as an option. 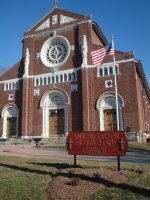 Parishioners who are using the online giving program tell us it is a great help to them, because it allows them to clearly budget the amount that they want to give back to God and helps them feel assured that their parish is receiving their gift even when they are out-of-town, too busy to remember an envelope, or attending Mass at another parish. Online Giving is now available for parishioners with WeShare, a simple, safe and convenient way to save time and support the church. WeShare is an online giving management system, which allows our parishioners to manage their donations to our parish efficiently, effectively, and securely. It is an automated means for our parishioners to support us financially through one-time or recurring contributions, as well as a tool to manage all their transactions (special event tickets, fundraising collections, book study purchases, mass intentions, etc.). Is on-line giving really necessary for such a small parish as ours? Can parishioners still donate using weekly envelopes? Absolutely. Although online giving replaces the need for weekly envelopes, donating through WeShareis not mandatory for all parishioners. We understand that not all parishioners are comfortable using a computer. We are thankful to receive your contributions anyway you want to give it to us. What if parishioners feel uncomfortable not having something to physically drop into the collection basket? How do parishioners change their personal information such as their bank account number, mailing address, or donation amount? Parishioners can make these changes themselves by visiting our website and clicking on the WeShare link. Donors can plan their contributions for the entire year—or they can change their donation amount online whenever they like.